Please note that above price is subjected to change and is for reference purpose only. Kindly contact Kia Nepal to get the latest showroom price. Note: Kia car price list was last updated on February 26, 2019. Kia Motors cars & SUVs in Nepal are solely distributed by Continental Trading Enterprises Private Limited. It is the same company which distributes Isuzu and Komatsu vehicles in Nepal. It is part of Continental Group of companies which has various other companies or products under its belt, such as Otis elevators, iPay remit, etc. The company has decades of experience in automotive industry, catering Kia motors cars & vehicles for years. Talking about Kia motors in global prospect, it is one of the best performing brands in terms of built and design quality. Kia motors, subsidiary of Hyundai Motors Corp and a Korean brand, is one of the largest automobile makers. Kia has successfully ranked at top in JD Power ratings (ranks vehicles based on number of problems per 100vehicles) for three years. Known for its unique family face which comes with signature grill also known as Tiger Nose, its car are simple yet elegant with its straight line design. 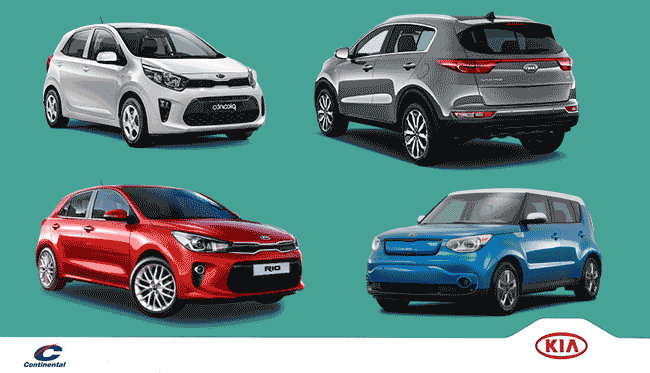 Kia cars are particularly known for being young, vibrant and reliable brand with quality built & design. Kia motors have a long experience in Nepali market. Continental Trading Enterprises at present are selling 4 different models of petrol/diesel cars including Picanto, Sportage, Rio and Carnival. All of these vehicles fall in premium category in their respective segment in Nepal. Apart from that, it has variants of electric vehicle i.e. Kia Soul. Sportage, a premium compact SUV is quite popular in the market, followed by Rio, which is a compact sedan car. Kia cars start at price of Rs. 34 Lakhs in Nepal and goes upto Rs. 1.11 crore, as mentioned above. You may contact Kia Nepal at information given below. Or you can message us your queries regarding Kia car price in Nepal or its specifications at our Facebook page.